Traditional English sausage rolls are perfect for any occasion but always a favourite at Christmas time. Simple and delicious that can be served warm or cold. Prepare them using your own favourite puff pastry recipe or like myself use store bought pre-made pastry from the grocery freezer section and save the effort. Remove from oven and immediately place on cooling racks. It is important to remove from baking sheets immediately since the sausage meat will create excess grease that you do not want the finished sausage rolls to sit in. It is important to remove from baking sheets immediately since the sausage meat will created excess grease that you do not want the finished sausage rolls to sit in. You can substitute fresh sage with ground sage if you prefer. When using ground sage in place of fresh sage, remember ground sage is stronger. About 10 fresh sage leaves are the same as a 3/4 teaspoon of ground sage. 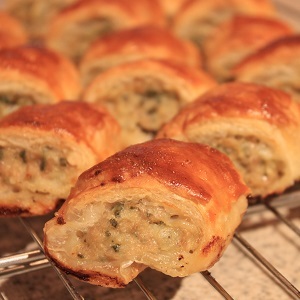 Sausage rolls freeze very well. Simply remove and allow to thaw and serve.